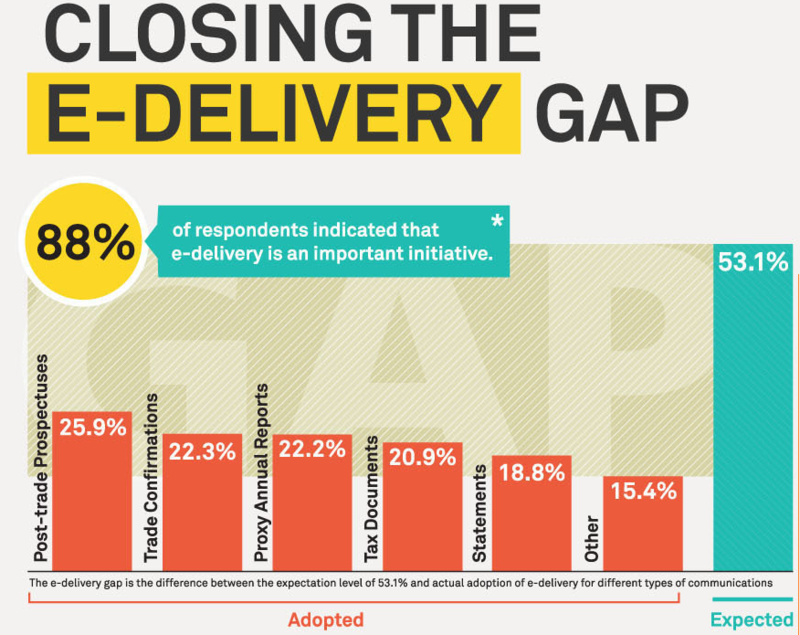 A new white paper from Pershing entitled, “Closing the e-Delivery Gap: The 2013 e-Delivery Survey,” shows a significant gap between financial executives who expect investors to adopt e-delivery and the actual number of investors who enroll in such services. Using this research, Pershing outlines methods to help financial professionals to increase e-delivery adoption rates despite current challenges and perceptions. While security benefits are a plus for those interested in adopting, security remains a concern among those who are not interested in adopting. On the negative side of the report, there is a wide gap in perception between what financial advisors believe their clients will do and the actions actually taken. Over 50% of survey respondents expected investors to enroll in at least one type of e-delivery communication, but only about 20% of investors actually chose to adopt those methods. The biggest barrier to investor’s adoption of e-delivery, according to this report, is that many investors operate several investment accounts from various firms. Investors are unwilling to master different user interfaces, forms and document delivery processes. Overall, investors struggle with a lack of knowledge of the technology, security concerns, and an unwillingness to change “paper-centric” behaviors. Pershing’s white paper outlines efforts that are currently being made to close this gap and encourage the transition from paper delivery to complete e-delivery communications however a broader industry initiative to adopt digital mailbox technology that would allow investors to receive all of their online communications in a single place might have greater impact. Five electronic communication mediums were measured in the survey to understand the percentage of respondents who had adopted e-delivery: statements (19.3%), trade confirmations (22.7%), tax documents (21.4%), post-trade prospectuses (25.9%), and proxy annual reports (22.2%). The two lowest-ranking services, statements and tax documents, contain the greatest amount of confidential personal data. The vast majority (70.6%) of respondents identified an e-mail notification with an authenticated link to a website as the most preferred method for providing e-delivery access. E-mail with document attached but no password required was identified as their least preferred method, with a response rate of 0%. According to participants, custodians use three methods to encourage e-delivery adoption: charging retail investors (58%), charging advisors (33%), and financial incentive to retail investors (42%). Sixty-seven percent of custodians offer no incentives. To obtain a copy of the white paper, visit the following link.